Schumer and his family al fresco on Saturday. New York senator Chuck Schumer learned a thing or two at all those graduation speeches he’s been making around the state. Specifically, that many students are participating in “academic doping.” In a Sunday interview with CBS New York, Schumer cited statistics showing that 35 percent of all college kids report using stimulants such as Adderall and Ritalin as a study tool. The senator wants schools to cut down on potential abuse by tightening their diagnosing and monitoring standards for students seeking the drugs, and urged young people to enhance their attention the old fashioned way: “There are better ways to pull an all-nighter and stay up,” he said. 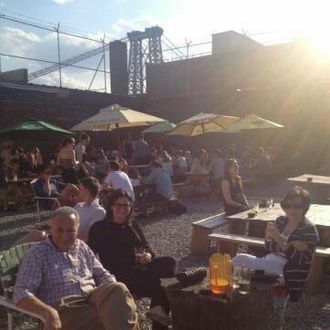 “There’s coffee, there’s things like NoDoz.” Was that a tip he picked up from the post-collegiate “Williamsburg hipsters” with whom he enjoyed some drinks and nice weather on Saturday afternoon?